Approximately 600,000 hernia repair operations are performed annually in the United States. Many are performed by the conventional “open” method. Some are performed laparoscopically. Laparoscopic hernia repair is a relatively new surgical technique to fix tears in the abdominal wall (muscle) using small incisions, a patch (mesh), and special cameras to view inside the body. It frequently offers a more rapid recovery for the patient, less postoperative pain, and a quicker return to work and normal activities. A hernia is a weakness or defect in the abdominal wall. It may be present from birth, or develop over a period of time. If the defect is large enough, abdominal contents such as the bowels, may protrude through the defect causing a lump or bulge felt by the patient. Both men and women can get a hernia. A hernia does not get better over time; a hernia will not go away by itself. Hernias most commonly occur in the groin (‘inguinal hernias’), around the belly button (‘umbilical hernias’), and near the site of a previous surgical operation (‘incisional hernias’). Frequently, hernias are easily felt and diagnosed. You may notice a bulge under the skin. You may feel pain when you lift heavy objects, cough, strain during urination or bowel movements or during prolonged standing or sitting. The pain may be sharp and immediate or a dull ache that gets worse toward the end of the day. Severe, continuous pain, redness and tenderness are signs that the hernia may be entrapped or strangulated. There is no acceptable nonsurgical medical treatment for a hernia. The use of a truss (hernia belt) can help keep the hernia from bulging but eventually will fail. The truss also causes the formation of scar tissue around the hernia making the repair more difficult. Once a hernia has developed, it will tend to enlarge and cause discomfort. If a loop of bowel gets caught in the hernia, it may become obstructed or its blood supply may be cut off. This could then become a life-threatening situation. Since hernias can be repaired effectively and with minimal risk, most surgeons therefore recommend that hernias be repaired when diagnosed, unless there is serious medical problem which makes it too risky. There are two main options for hernia repair. One option is The traditional, open repair has been the gold standard for over 100 year. This standard method of hernia repair involves making an incision in the abdominal wall. Normal healthy tissues are cut until the area of weakness is found. This area, the hernia, is then repaired with a prosthetic material called mesh which is sutured in place to strengthen the area of weakness. Finally, the skin and other healthy tissues that were cut at the beginning are sutured back together to complete the repair. Laparoscopic hernia repair has been developed over the past decade. It is usually performed under general anesthesia. Laparoscopic techniques of hernia repair are especially attractive when patients are dealing with recurrent hernias or bilateral inguinal hernias. Benefits of laparoscopic hernia repair include shorter operative time, less pain, shorter recover period. In laparoscopic hernia surgery, a telescope attached to a camera is inserted through a small incision that is made under the patient’s belly button. Two other small cuts are made in the lower abdomen. The co2 is then insufflated to open a space between the abdominal muscle (rectus muscle) and the inner layer of abdominal wall (peritoneoum). The hernia defect is identified and reinforced with a ‘mesh’. A multicenter report of 736 laparoscopic hernia repairs using the prosthetic patch technique found a recurrence rate of 2.2 percent at a mean follow-up of 6 months. Incisional, Ventral, Epigastric, or Umbilical hernias are defects of the anterior abdominal wall. They may be congenital (umbilical hernia) or acquired (incisional). Incisional hernias form after surgery through the incision site or previous drain sites, or laparoscopic trocar insertion sites. Incisional hernias are reported to occur in approximately 4-10% of patients after open surgical procedures. Certain risk factors predispose patients to develop incisional hernias, such as obesity, diabetes, respiratory insufficiency ( lung disease), steroids, wound contamination, postoperative wound infection, smoking, inherited disorders such as Marfan’s syndrome and Ehlers-Danlos syndrome, as well as poor surgical technique. Approximately 90,000-100,000 incisional hernia repairs are performed annually in the United States. These hernias present much the same way inguinal hernias do. That is, they present with a bulge near or at a previous incision. Some patients may experience discomfort, abdominal cramping or complete intestinal obstruction, or incarceration as a result of these hernias. The principle of surgical repair entails the use of prosthetic mesh to repair large defects in order to minimize tension on the repair. A tension free repair has a lesser chance of hernia recurrence. Traditionally, the old scar is incised and removed, and the entire length of the incision inspected. Generally, there are multiple hernia defects other than the one(s) discovered by physical examination. The area requiring coverage is usually large and requires large surgical dissection. A prosthetic mesh is used to cover the defect(s), and the wound closed. This is a major surgical procedure and often complicated. Infection rates following repair may be as high a 7.0%. Recurrence can be up to 5%, or higher, depending on the patient’s preoperative risk factors. While the use of prosthetic mesh has decreased the number of recurrences, it has also been implicated in increased infection rates, adhesion or scar formation of the abdominal contents to the anterior abdominal wall leading to intestinal obstruction and fistula formation. However, overall, recovery is usually excellent and patients return to normal activity within a matter of weeks. The laparoscopic repair of ventral hernias was designed to minimize operative trauma to the patient. Three to five small incisions are made away from the hernia defect. The incarcerated fat or bowel was reduced from the hernia sac. A large piece of prosthetic mesh is placed on the hernia defect with a wide margin of mesh outside the defect. The mesh is anchored in to place with eight full thickness sutures and secured to the anterior abdominal wall with a varying number of tacs, placed laparoscopically. Risks of laparoscopic surgery includes but not limited to breeding, infection, damage to internal organ like bowel, major vessels and nerves, complication of anesthesia like heart attack, stroke, post operative pulmonary emboli, deep venous thrombosis, pneumonia, post-operative bowel obstruction, recurrent hernia and chronic pain. In a small number of patients the laparoscopic method is not feasible because of an inability to visualize or manipulate the organs involved. These patients should be converted to the open technique. Factors that may increase the possibility of converting to the “open” procedure may include obesity, a history of prior abdominal surgery causing dense scar tissue, or bleeding problems during the operation. The decision to perform the open procedure is a judgment decision made by surgeon either before or during the actual operation and is strictly based on patient safety. More recently, minimally invasive hernia repair surgery can be performed using robotic technology. The da Vinci System is a robotic surgical platform designed to enable complex procedures of all types to be performed. There have been some major benefits experienced by surgeons using the da Vinci Robotic Surgical System over traditional laparoscopic approaches. These benefits are greater surgical precision, increased range of motion, improved dexterity, enhanced visualization and improved access. 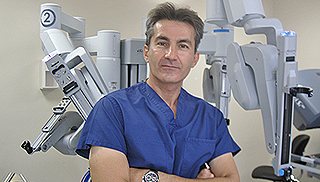 At NEWPORT LAPAROSCOPY, Dr. Iraniha performs robotic hernia repair procedures. After a thorough evaluation, Dr. Iraniha will determine whether robotic hernia repair surgery is appropriate for a particular patient’s situation.